Todd Minikus and Uraguay. Photos – © The Book LLC. North Salem, NY – May 12, 2013 – Todd Minikus and Legacy Stables’ Uraguay won the highlight event of the first week of the Old Salem Farm Spring Horse Shows, the $50,000 Old Salem Farm Grand Prix presented by Suncast. They were fastest in the jump-off to beat Darragh Kerins (IRL) on E-Muze Yek and Christine McCrea (USA) with Romantovich Take One. Along with top show jumping, there were Grand Hunter Champions awarded, as well as Classics for the Medium and High Junior/Amateur-Owner Jumpers. This concluded the first week of competition at Old Salem Farm. Week two runs May 14-19. There were 47 entries in today’s grand prix and they jumped a course designed by Brazil’s Guilherme Jorge. Nine found the way to a clear round to advance to the jump-off. The early pacesetter in the jump-off was Christine McCrea of East Windsor, CT, on Romantovich Take One, owned by Candy Tribble and Windsor Show Stables. They won Friday’s Welcome Stake and set a very fast pace of 39.06 seconds that would hold up for third place in today’s class. Three horses later it was Minikus and Uraguay, a 12-year-old KWPN gelding by Nairobi x Colino, who were speedy through the first part of the jump-off, but it was a long run across the field to the Suncast oxer that had the crowd holding their breath. Uraguay gave a great effort, made two more rollbacks, and galloped to the final oxer to stop the timers in 37.36 seconds for the win. Following Minikus, Leslie Howard and Tic Tac, owned by Jane Clark, were clear in 40.33 seconds for fourth place. Darragh Kerins and E-Muze Yek, owned by Kerins and Maarten Huygens, were the only others to contest Minikus’ time. Another big grey gelding like Uraguay, E-Muze Yek thundered around the course but couldn’t quite catch the time. Their time of 38.87 seconds was fast enough for second place, the same red ribbon that they received in Friday’s Welcome Stake. Kerins has ridden the nine-year-old Belgian Warmblood gelding by For Pleasure x Carthago off and on since he was imported as a six-year-old by Norman Dello Joio from Belgium. He and Maarten Huygens bought him in the middle of the winter circuit. Minikus started riding Uraguay toward the end of the FTI Consulting Winter Equestrian Festival after the horse showed successfully in Europe with Dutch rider Albert Zoer and in the United States with Mario Deslauriers. Minikus was presented with a pewter cheese plate for his win today. Before the grand prix, the smallest riders at the show gathered on the grand prix field for the Dyer Equestrian Leadline class. All of the kids participating were congratulated with blue ribbons and prizes. After a week of final exams at Harvard University, Katie Dinan came to Old Salem Farm ready to get back on her horse and in the ring. She and her trusty partner of five years, Vancouver, galloped to victory on the grass Grand Prix Field in the $10,000 High Junior/Amateur-Owner Jumper Classic. She and Vancouver, a 15-year-old gelding by Voltaire II, beat a list of 33 competitors and five in the jump-off after they finished in the fastest time of 41.24 seconds. Second place went to Michael Hughes on Luxina as the only other double clear in 42.76 seconds. Finishing in 39.55 seconds, but with four faults, Lillie Keenan and Vanhattan were third. The winner of today’s $7,500 Medium Junior/Amateur-Owner Jumper Classic sponsored by The Manocherian Family was 15-year-old Kira Kerkorian of East Hampton, NY. She rode Leopold 221, a nine-year-old Westphalian gelding by Lordanos, to the top of the 48-entry class. There were 13 that made it through to the jump-off, and the best pair of Kerkorian and Leopold stopped the timers in 40.703 seconds. Second place went to Taylor Burns on Cordero Zaffiro in 40.840 seconds, while Wesley Newlands and Vertigo were third in 41.198 seconds. For her win today, Kerkorian was also presented with a $500 Der Dau gift certificate. In this morning’s 7/8 Year Old Young Jumper Qualifier sponsored by Watershed Agricultural Council, Jeffery Welles rode Bilion to victory for owner Triton Ventures Farms Inc. Darragh Kenny and Oakland Ventures LLC’s Cequila was second, and Penny Brennan on Class Act, owned by Jacquelyn Ventorino, was third. The Grand Junior Hunter Champion was Parkland, owned by Jennifer Gates and ridden by Lillie Keenan. The pair was champion in the Small Junior Hunters and placed fifth, second, and second over fences and won the under saddle. The reserve champion in the Small Junior Hunter division was Wonderland, ridden by Morgan Ward for John Skinner. Keenan was also named Best Junior Rider on a Horse. 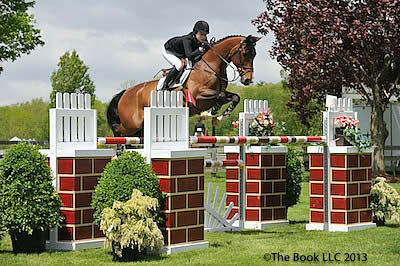 Keenan plans to show Parkland at the Devon Horse Show. “He is really the kind of horse that you can count on for special events, so hopefully that works out for us. He’s fancy, and everything you’d want in your ride to go to Devon,” she remarked. The Large Junior 15 & Under Hunter division awarded the championship to Catwoman, ridden by Ailish Cunniffe for Missy Clark, and Sophie Michaels and Further Lane Farm’s Mahalo picked up the reserve championship. Bishonen, ridden by David Oberkircher for Southlands Farms LLC was named champion in the Large Junior 16-17 Hunters, while Cameo, ridden by Mallory Edens for Mr. and Mrs. Ralph Caristo, was the reserve champion. The Grand Pony Hunter Championship went to Isport, ridden by Morgan Ward for Redfield Farm. They won all four over fences classes and were third in the under saddle to win the championship in the Green Pony Hunters. The reserve champion in the division was Pride, ridden and owned by Francesca Dildabanian. Imported from Europe by Emil Spadone, Isport had not competed in hunter classes before coming to the U.S., but she learned immediately. “She started out like this and she’s never changed. It’s really weird. We never get (horses like) these!” Ward said with a laugh. The Small Pony Hunter division, sponsored by Gotham North, awarded the championship to Rolling Stone, owned by Further Lane Farm and ridden by Madeline Schaefer, while the reserve champion was Coco Fath and Blueberry Hill, owned by Jordyn Rose Freedman. Mimi Gochman swept the Medium Pony Hunters with David Gochman’s True Love as champion and Truly Noble, owned by Pegasus Show Stable Inc., as reserve champion. For her great success this weekend, Gochman was named as the Best Junior Rider on a Pony. In the Large Pony Hunter division, Pride and Francesca Dildabanian picked up their second championship of the week. Daisy Farish and her pony Beau Rivage were reserve champions. 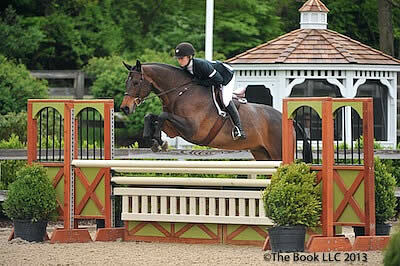 The Grand Children’s Hunter Champion was They Say, ridden and owned by 16-year-old Page Soper of Southport, CT. They were awarded the Hunter Horse Challenge Trophy. The pair was the Children’s Hunter 15-17 champion. The reserve championship went to Qrocus Landais, ridden and owned by Sabrina Kalimian. Soper and They Say won all three classes in their division along with the Marshall & Sterling Children’s Hunter Classic. Coming into the second round, they were leading the class. “I was a little nervous, but I knew I could trust him,” Soper said. They have been together for a year and have competed at shows like Fairfield, Vermont Summer Festival, and Old Salem. This was their first Grand Champion award. “I’m really happy. He was so good. My trainer, Jenni Martin-Rudaz, was so helpful. He’s smooth and listens well,” she noted. Soper hopes to go to the Marshall & Sterling Finals later this year. The Children’s Hunter 14 & Under championship went to Allura, ridden and owned by Samantha Cohen. For her top riding, Cohen was named Best Child Rider on a Horse. Reserve champion was Troubador, ridden and owned by Daisy Farish. The Best Children’s Rider on a Pony Award went to Eliza Altman, who was champion in the Children’s Hunter Pony Large division. They were given a plate donated by Pegasus Therapeutic Riding. The reserve champion was Celtics Creek Irish Belle, ridden by Siena Vasan for Peacock Ridge LLC. In the Children’s Hunter Pony Small/Medium division, Beaucatcher, ridden by Sienna Pilla for owner Abigail Blankenship, won the championship and Canterbrook Prince Charming, ridden by Kathryn McCarthy and owned by Joe Currais, was reserve champion. For full results, please visit www.horseshowsonline.com. The second week of the Old Salem Farm Spring Horse Show continues on May 14-19.